The April 24, 1913, edition of the Woodstock Sentinel proudly touted the community’s “base ball” team, noting that team captain, Randall, was putting his players through their paces. “Should a little bird happen to whisper in your ear that the Woodstock Baseball club would not be among the top-notchers this season, kindly inform the said bird that the report is all a mistake,” the paper wrote. Although I’m not sure if the season lived up to expectations, I do know that baseball was a nationwide passion at the time. There were factory teams, such as those sponsored by the Oliver Typewriter Co. in Woodstock, as well as industrial leagues, church and community teams, and barnstorming exhibitions. The latter not only pitted local boys against professional teams, such as the White Sox and Cubs, but it pitted men against women. Bloomer squads were named after their attire – functional, loose-fitting pantaloons created by suffragette Amelia Jenks Bloomer. 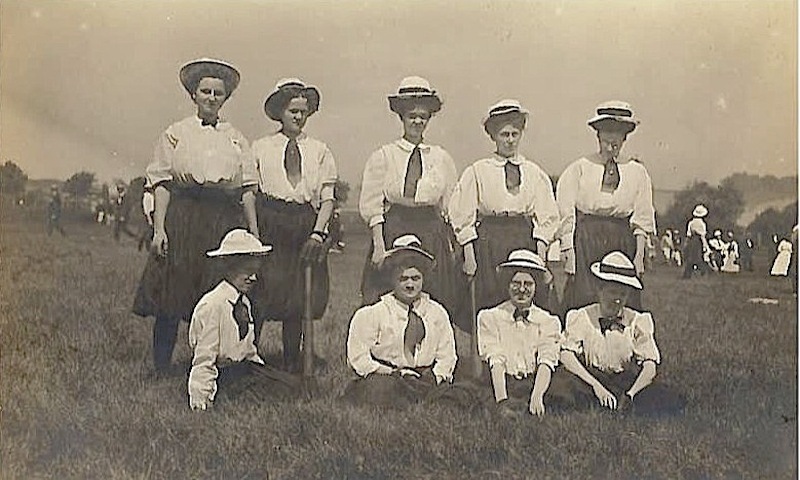 Hundreds of teams – from places such a New York and Chicago – provided women an opportunity to travel and play this traditionally all-male sport during the late 19th and early 20th centuries. Still, gender equality did not come easily. A 1906 edition of the McHenry Plaindealer noted that the Bloomer Girls were “too slow for our boys” – even though the girls made a game of it. The McHenry Blues prevailed, 8-5. A 1916 game in Harvard, played with “gasoline torches illuminating the field,” was another close contest. Harvard defeated the visiting Bloomer Girls, 14-11. Bloomer Girl teams existed for about 40 years, playing exhibition games against men’s amateur and semi-pro “Club Nines.” Typically, their rosters included at least one male player. A game preview in the Aug. 30, 1906, the Plaindealer predicted the Chicago Bloomer Girls would give the home team a very competitive match – and at the bargain price of 25 cents, or only 10 cents for women and children. “They play a good game of ball and will give the lads plenty to do to win out. They have in their lineup some of the best lady athletes in the world, and it will be well worth the price of admission to see them play the national game,” the paper wrote. By the 1920s, men had returned from war and these bloomer leagues began to die out. Aronson, in The National Pastime journal noted: “In 1943, Philip K. Wrigley, fearing that the manpower shortage caused by World War II would harm major league baseball and his own fortunes as owner of the Chicago Cubs and Wrigley Field, capitalized on the abundance of female softball talent by establishing the All-American Girls Professional Baseball League. 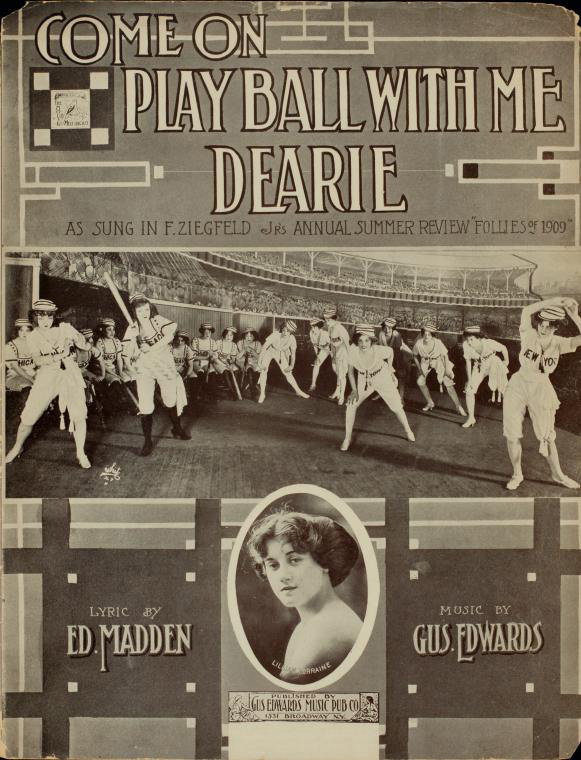 In this early phase of the league, the game was a hybrid of softball and baseball. It featured underhand pitching, for example, but it also allowed leading off and stealing bases, forbidden in regulation softball. League managers felt that base stealing would make the game more attractive to fans. “The AAGPBL, made famous in the movie “A League of Their Own” (partially filmed at the Illinois Railway Museum in Union), began with four teams located in midsize Midwestern cities: Kenosha, Wisconsin; Racine, Wisconsin; Rockford; and South Bend, Indiana. The Peaches played until 1954. Rockford marked the 75th anniversary of the Peaches this year with a series of events culminating in a June 3 baseball game at Beyer Stadium. This and other fundraisers eventually hope to raise the $7 million needed for a proposed International Women’s Baseball Center, constructed across the street from Beyer Stadium on 15th Avenue in Rockford. Reportedly, more than $15,000 has been raised so far. For information about the center or upcoming events – such as Women in Baseball Week from July 22 to 28 – visit www.internationalwomensbaseballcenter.org. The McHenry County Historical Society’s Perkins’ Players explores the politics and fallout associated with construction of the McHenry dam at 7 p.m. Wednesday at Perkins Hall – the society’s 1885 former Seneca Township Hall at 3600 Franklinville Road. Admission is free to the historical re-enactment titled “Should We Give a Dam or Not?” Seating is limited. For information, visit www.gothistory.org.